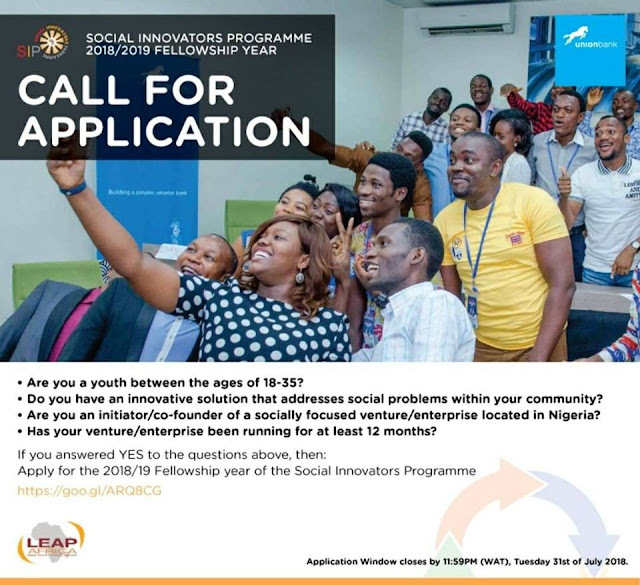 - Social Innovators Programme 2018/19 Fellowship and Awards. Are you a youth between the ages of 18-35? Do you have an innovative solution that addresses social problems within your community? Are you an initiator or co-founder of a socially focused venture or enterprise which located in Nigeria and has been running for at least 12 months? If you answered YES to these questions, then apply for the SIPA 2018/19 Fellowship year. The Social Innovators Programme & Awards (SIPA) is LEAP Africa’s platform for showcasing, empowering and equipping young change makers with requisite skills and effective tools for building sustainable enterprises. Over the past four(4) years, LEAP Africa with the support of Union Bank Nigeria and other corporate sponsors, have enabled these young change makers transition their social change ideas into scalable social enterprises. During a programme cycle, 20 social entrepreneurs selected from a pool of applicants, participate in activities outlined for the fellowship year. The initiatives of Fellows cover various aspects of the society, such as Agriculture, Youth Empowerment, Education, Science & Technology, Health, Law, Human Rights, among others. Fellows are empowered through series of training sessions (physical and online), mentorship, provision of local & international funding and partnership opportunities. These activities culminate into an award ceremony where outstanding Fellows are rewarded with seed grants and showcased. We are seeking applications from budding social entrepreneurs who would be available and willing to participate in the various activities outlined for the fellowship year. The 2018/2019 fellowship cycle begins in November 2018 and ends November 2019. Youth between the ages of 18-35 years, whose ideas and initiatives offer effective solutions to challenges in local communities across Nigeria. Provision of local and international opportunities: we support fellows with opportunities to get access to grants, trainings, workshops, organized by our partners both locally and internationally. Fellows have been able to access grants from international grant-giving organizations through their participation in the SIPA. Level of creativity/innovation applied in their entrepreneurial approach towards social change. Experience mobilizing people and resources to achieve set goals. Motivation for application: Applicants must give compelling reasons why they would like to participate in the fellowship programme and also show a strong desire to increase the impact of their change initiative. Demonstrate a passion for social change and active participation in community building. i) Valid Government issued identification. 11:59 PM, Tuesday 31st July 2018.